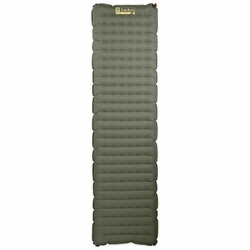 NEMO Tensor Field Insulated Sleeping Pad. Designed with guidance from professional backcountry hunters and anglers, meant for exploration off the beaten path. Our new Tensor Field™ pads feature NEMO’s Spaceframe™ baffles ensuring a stable, comfortable sleep surface and double synthetic insulation for extra warmth. The 30D coated underside of the pad also provides added durability while allowing the use of pressure-sensitive adhesives for quick and easy field repairs. Spaceframe™ baffles (die-cut trusses of low-stretch fabric) creates a more stable sleep surface, better for rolling side-to-side and for keeping your elbows off the ground when reading a book. The pad’s coated underside allows the use of pressure-sensitive adhesive patches for field-expedient repair.